Kids & Families Together Executive Director David Friedlander was a recent guest on the “Locals Only” show with Kelli McKay on News Talk 1520 KVTA. 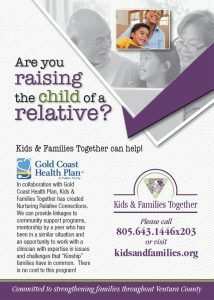 Click here to listen to David talking with Kelli about the 2011 Kinship Family FunDay event which took place at El Sueno Equestrian Center in Somis, CA on Sunday, May 22. A special thanks goes out to KVTA for having us as a guest to discuss the needs and support for kinship resources in Ventura County.